"What you will see here is a remanant town which stood larger than Yuma in 1878. Her weather beaten buildings remain in an area little changed from the 1800's. The mills stand silent, housing original boiler, stamp mill, and elevator, as if tomorrow they will awaken to the thunderous roar of steel crushing rock. The boardwalks still creak, the church bell rings out, the five saloons just await the story of their last shootout. The horse trails are beaten down & lead to the blacksmith. The old stage harness lies empty and the mail bags are waiting to be filled. The old glass has truned dark purple from years of basking in the sun. The machine shop has few changes, and old uncovered Roulette table is ready to spin up your fortune. The old Mercantile is still well stocked, the doctor and dentist office with all the tools to fix you up still awaits your visit. If you need a Post office or want to buy a lot, the Land office and claim office sits on the hill. 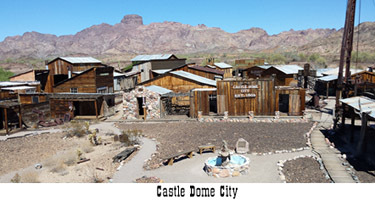 All the details that made the 1800's the wild west are here for you to experience. Only the rugged need apply was a true saying and an old quote said, referring to the wagon trains that came from east to west, "the weak died along the way, and the cowards never started". It was a tough time, but folks are willing to endure much in order to be free. Come by, and you can visit the old graveyard, or stand on the balcony of the 2nd floor of the doc's office and see for miles. Check out the old buildings with everything from the 1889 Levi Strauss pants to the dainties in the dress shop. May 1st through September you will need to call for hours. October 14th through April 30th we are open 7 days a week. DIRECTIONS. North from Highway 95; Turn at mile marker 55 and then go 3 miles on paved road, then head straight for another 7 on a gravel road. 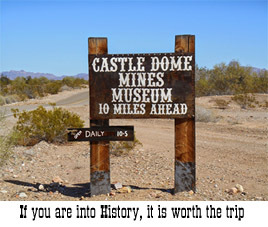 Go straight and you will arrive at Castle Dome Mine Museum. Prices: Adults $15.00 ages 12 , Children $7.00 ages 7 - 11, Children 6 and under are free.